A handicap shower chair can offer flexibility, practicality and a variety of features for use in a residential disabled bathroom. bathtub or shower that can be removed when not in use. back of the tub or shower needs to have at least a two-inch thick solid backing material. The ADA recommends that these be made of wood, although, steel can be used. Wall mountable shower seats are usually available in lengths of 26, 28, 32, and 34.5 inches wide. 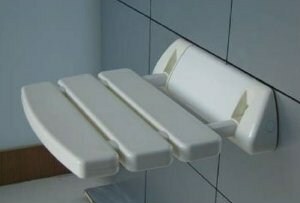 These wall mount shower seats can fold down against the wall when they are not in use, freeing up the shower area for anyone who does not wish to use a bench. They are comfortable and the seats are available in a variety of different materials including stainless steel, wood, cushioned, and in either solid or slatted styles. a closet or under a bed. person can hold these for balance when getting in and out of the tub or shower. 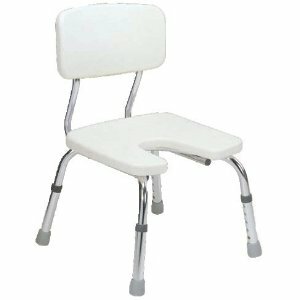 The major benefit of this type of handicapped shower chair is its low-cost and easy portability. These are also useful when vacationing. Although ADA bathroom requirements demand that hotels to offer handicap-accessible rooms, they are not penalized if the rooms they have are taken. Since these adjustable shower chairs easily "stow and go," they are great for when handicap shower stalls are not available and only a conventional bathroom can be used. Both styles are safe, effective and make life easier for those with disabilities. Because there are so many choices on the market, it is best to compare prices, styles and features to find the right one for your situation. For additional safety purposes, it's also wise to choose a handicap shower chair that is ADA compliant.